and the last pair of socks for the thesis. i really like mountain colors. not only are they only an hour from my hometown, they make such unique yarns – so dark and scrumptious. i used the french (classic round) heel and the french toe from Knitting Vintage Socks by Nancy Bush. these were mostly knit while sitting on my exercise ball for posture and listening to knitting podcasts. and i must ask, because i’m so new to such things, do any of you have a favorite knitting podcast? which and why? so, i’ve been a bit under the weather for a while now. i can’t seem to shake the inflammation in my shoulder muscles. my shoulders hurt, so i made ben massage them and apparently that made them even worse. now i’m taking my fair share of ibuprofen and feeling very tired. yesterday i slept three hours in the middle of the day… because the day before i did dishes, went on a walk, finished these socks, spun a bit, i’m sure i used the computer- that doesn’t sound like too much in one day to me. oh well. i guess i’ll just have to live it out. i did manage to get a prescription for a massage therapist, but i have to wait until the inflammation goes down. how’s that for a catch 22? in thesis news, we all met in the library yesterday. i must say that my show is like my living room in many ways- full of yarn and knit goods and spinning stuff. if you bring my stuff, it will feel like my living room which is exactly what i want, a den of fibery goodness and learning (lord only knows that ben will appreciate being rid of some of it for a while too). so the rare books reading room, no problem. unfortunately (my advisor and i both thought so) the room is no longer the room with all of the books in it like in the old library. ah well. my part of the show will be fine. currently i’m more worried about the other two people, because they do need optimal space and the space available to them is not optimal to say the least. i still think that the ethical move on Regent’s part would have been to rent a gallery somewhere. really, if they expect you to be a professional artist before you come, they need to treat you like a professional artist when you get here. 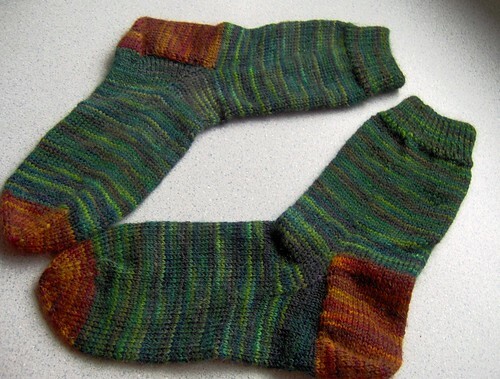 This entry was posted in knitting, socks, thesis by cosymakes. Bookmark the permalink. I just found your blog and I really enjoy it! Good luck with your defense. I can see your fibery goodness just opening up that boring room. I listen to Lime and Violet while I knit and I have to admit that I am addicted to the old episodes. Its like sitting with friends and laughing and is just crazy enough to keep me entertained but not distracted from the stitches. Sorry to hear you’re not feeling well. Wrapping up a thesis is stressful, maybe good health will return after this all wraps up. I haven’t been listening to podcasts for very long. I listen to Lime and Violet too. And Cast On, It’s a Purl Man, The Knitting Cook, Knitting Psychos, Pointy Sticks and just recently I started to listen to Sticks and String. Cast On is my favorite by far. I love Brendas’ warm voice, the variety in the show, the history and wisdom she imparts. It feels like I’m knitting in front of a fireplace with an old friend. Lime and Violet is sort of the fun flipside of that for me. Not enough knitting content, but funny enough that it just doesn’t seem to matter! Cast on is like a heartwarming casserole and Lime & Violet are dessert. Hmmm, now I’m hungry.